Though Nationals are done, the dance fun has not stopped. 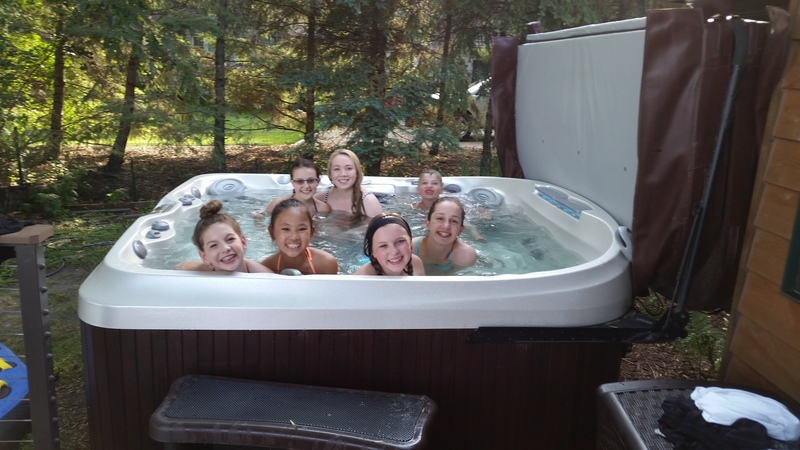 Several members of Teen Company (plus one brother) in the hot tub. The weekend after Nationals was over, one of the families invited all of the Teen and Senior company dancers to a party at their cabin. This is the second year we have been able to go, and it is always a good time. The kids can swim, hang out in the hot tub, or just sit in the boats and chat (what they did much of the time). Apparently, most of Senior Company fit in the boat! They had planned to go out tubing, but when it was the teens’ turn, a storm rolled in. Only a couple people got to go before it started lightning. I was lucky enough to be one of those who did, but had I known it was going to start lightning, I would have let other girls go ahead of me. I felt bad that some didn’t get a chance. While it only rained for a very short time, the lightning was enough to ruin the fun on the lake for the rest of the night. T hey always have a pot luck, so there was plenty of delicious food. The best part though, was the great company with so many dance families, and a couple of teachers! Grace, Michael, and I, ready to walk in the parade. 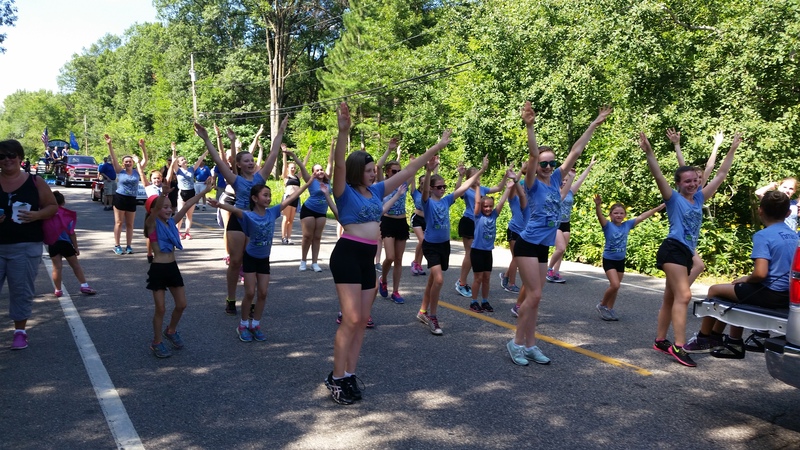 One of our favorite summer time activities with Lake Area Dance, is to participate in parades. I usually hold a banner or pass out candy. Grace usually dances with all the dancers, and Michael helps pass out candy, or just sit in the back of the truck being studly. I always point him out to boys in the crowd, letting them know that we have classes for boys, and that he is a dancer too. 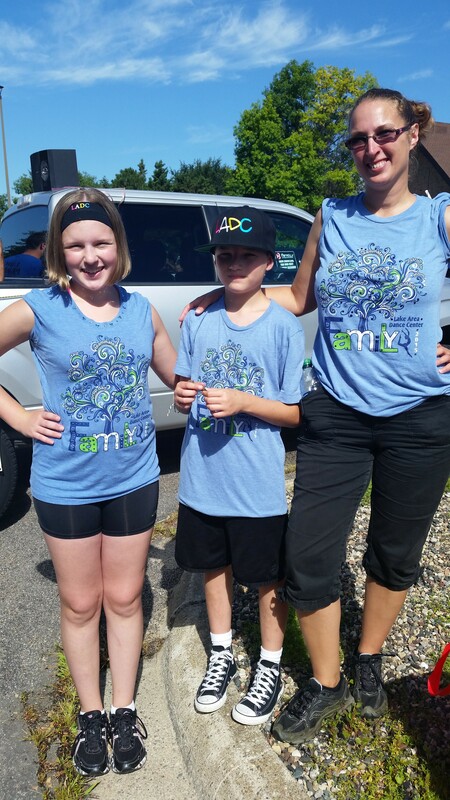 The first parade of the season, was the Slice of Shoreview parade. There was a pretty decent turn out for this parade, from both the dance studio, and people watching the parade. While it was a very hot and sunny day, it was a lot of fun! Sadly, we will be on vacation for the second parade our studio is participating in. I’m hoping they have great weather! Dancing down the streets of Shoreview. You can tell how hot it was!! There are a few things I didn’t take pictures of, but are a key part of summer for LADC dancers. Those are the summer intensives, auditions, and master classes. Audition night was last night. I was working at the front desk, so I got to see almost all the dancers getting ready. I was so proud of all of them! As they were waiting their turn, they were practicing, helping each other get those last minute pieces they weren’t confident about, and encouraging each other. Everyone was excited and nervous. All of the dancers came out looking exhausted. You could tell they really gave it all they had! Most of the dancers said they felt really good about how things went. Grace was feeling especially proud, telling me she “got her triple turns… not just once, but all the way across the floor.” I loved hearing that pride in her hard work! I think the older teens were especially nervous, because they are at an age where they could stay in the same group, or move up to the senior level. No one really knows where they might end up for next year! Also, there were several guest judges for audition night. When you are dancing in front of new people, and you are dancing for a spot on a team, that can be really nerve-racking! Master classes took place several days a week at Lake Area Dance Center. Many of the classes were in the morning while I was teaching summer school, so Grace could only attend a handful of them. Classes she took included acro/flexibility, modern/improv, contemporary, and jazz classes. There were several different instructors teaching the classes. Some teachers were from our studio, some were guest teachers from other studios. At $10/class (or $9/class if they bought a 5 class punch card), the classes were a good deal! The month of August will give dancers a bit of a break from dancing, but the fun will not end!